Drake will by hand or blower, remove debris from the inside of gutters* or soft wash gutter exteriors to remove mildew or electrostatic stains. When requested, we will install permanent aluminum gutter screens (Leaf-Relief). With our gutter protection system, you will never have to have gutter debris cleaned again. When requested, we will replace existing gutters with continuous aluminum guttering and downspouts, …ensuring rain water will flow away from the house as designed. 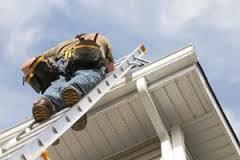 *Ordinarily Drake performs gutter (debris) cleaning only when on the property to perform its primary services, i.e. window cleaning, pressure washing applications. During peak ‘leaf-falling’ season, Drake may not be available to do gutter cleaning (only) jobs but will attempt to refer its window-washing and pressure-washing customers to a competent contractor whose sole business is that of gutter cleaning.